As my T collection grows and I gain experience with different species, I’m finding that I’m developing an affinity for the larger South American Ts. 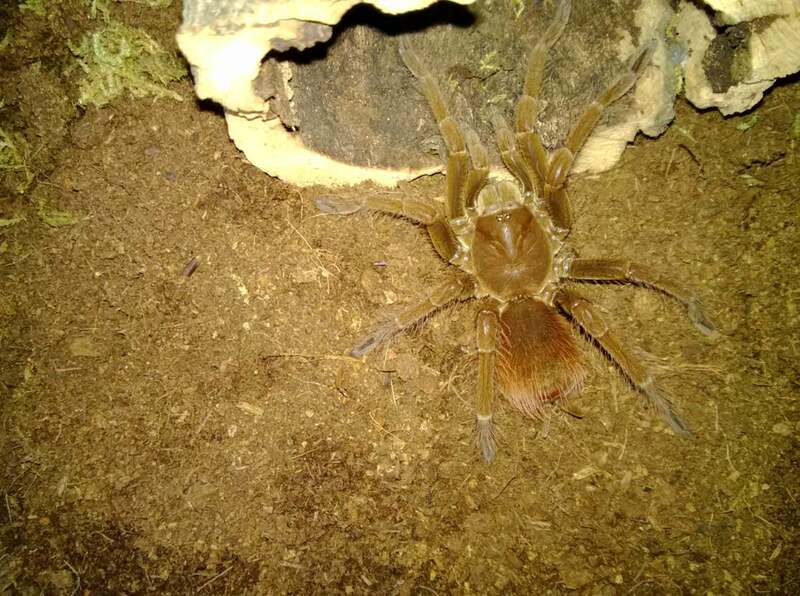 Don’t get me wrong, there is definitely a place in my collection for some of the slow-growing genera, like aphonopelma, grammostola, and brachypelma. Many of the species in these genera are simply gorgeous, and their slow growth rate means that I’ll have these guys for many years. However, for the impatient keeper in me, the faster-growing, aggressive eaters are just a thrill to watch. Recently, I decided to investigate some new species for potential purchase, and I wanted something big and feisty. While perusing the Net-Bug site, I came across a Pamphobeteus antinus, or “Steely Blue Leg”, female for sale. I had researched several species in the Pamphobeteus genus many months back, and at that time, I wasn’t sure I was ready for a T that required a bit more humidity. Having gained some experience since then and become more skilled at maintaining humidity in the enclosures, I decided that I was ready for this species. My 3.5″ P. antinous female. For my new acquisition’s home, I set up a large Kritter Keeper with about 5″ of a moist 50/50 peat moss and coco fiber mix. As the heavily-vented tops of KKs allow for too much ventilation for species requiring higher humidity, I used contact paper to block off much of the top and sides while still allowing for cross ventilation. Using a 5″ cork bark round, I sunk part of into the ground as a starter burrow and covered it with soil and sphagnum moss. As I want to maintain a higher level of humidity, I also provided her with a large water dish. Once a week, I sprinkle water on her substrate and on the sphagnum moss (think a good, quick rain shower) to keep the substrate from drying out too much. For temperatures, she is kept in the low 70s during the night, and high 70s/80 during the day. 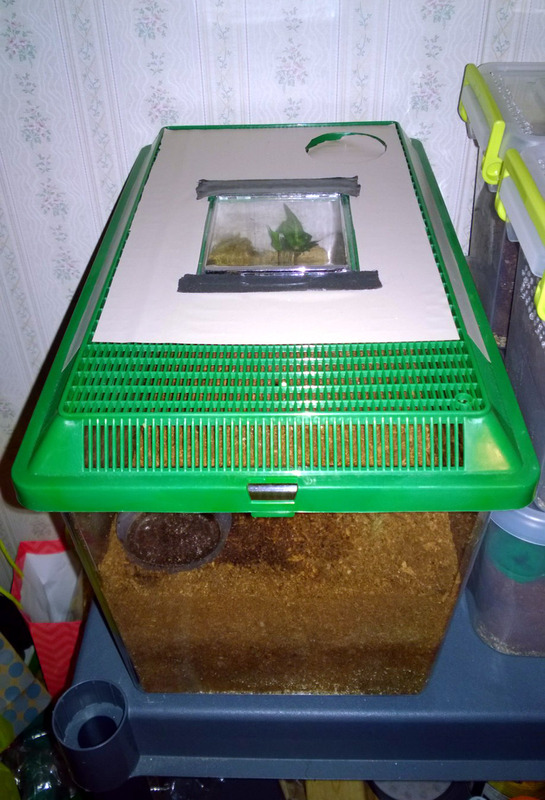 A large Kritter Keeper modified to accommodate a species with higher humidity requirements. It didn’t take long for the P. antinous to create an impressive burrow. Gnawing through the bottom of the cork bark, she dug straight to the bottom, constructing a small compartment in the lower corner. Here she sits until she detects prey items above. Alerted to a meal, she bolts from her hide, her lithe legs tapping against the plastic as she scrambles for the surface. Out of all of my Ts, this is the first one I’ve actually HEARD coming for a cricket. The speed and ferocity she displays when attacking her food easily rivals that of my P. cancerides. Right now, she gets four large crickets, or two 1+” dubia roaches, a week (this species is known for being a good eater). My P. antinous inside its den (back view). With my female still sporting her immature reddish-brown colors, I will look very forward to seeing if she gets any of her “steely blue” coloration on next molt. Also, as this is also considered to be a species with a fast growth rate, I will be anticipating quite a size jump. Although I’ve only owned her for a couple months, my P. antinous is proving to be one of my most interesting tarantulas.